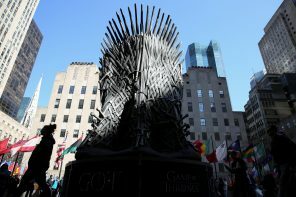 HBO’s hit series is ending as parent AT&T, Amazon, Apple and Walt Disney launch their claims to the streaming-video crown. Netflix, though, will be hard to usurp. Elsewhere, India’s weeks-long election gets underway. And global economic growth collides with nationalism’s rise. Both tech companies sold shares for more than underwriters previously indicated. True, market debuts give little indication of long-term success. When insiders already hold supervoting shares, though, leaving a bit less on the table is a gentle reminder of who calls the shots. The high cost of living, homelessness, and climate change are prompting young adults to consider leaving the Bay Area, recent surveys show. Such intractable issues aren’t new. But they’re now threatening the region’s ability to attract and keep talent. That’ll hit its economy. The telecom firms have yet to convince U.S. officials over their $88 bln merger. They may have to make cuts, like selling T-Mobile’s prepaid unit or spectrum. Bigger rivals Verizon and AT&T are already diversifying. Unless trustbusters get draconian, combining is the best bet. The smartphone maker and chips firm ended a two-year fight over royalties, with a cash payment to Qualcomm and a licensing agreement. Apple can’t risk being stuck with second-rate chips, and Qualcomm has huge revenue at stake. At first blush, both sides benefit from the truce. The video-streaming service boosted its subscribers by a quarter in the last three months even though it raised prices. It’s now valued at 70 pct more per user than rival Hulu, in which Disney just raised its stake. Netflix’s success isn’t impossible to copy – just very expensive. Tech firms seeking to go public have steadily ramped up the caveats for would-be investors. The ride-hailing app’s IPO has 30 times as many words of warning as Microsoft did in 1986. Lawyers add more boilerplate over time, but more complex, wobblier firms are also floating. The ride-hailing giant's IPO papers detail the deals struck when it pulled out of cutthroat markets like China, taking stakes in homegrown rivals instead. The pacts look asymmetrical, tying up mostly Uber. As $65 bln Didi and others expand abroad, the snarl only gets worse. The search giant’s parent Alphabet has multiplied its investment in the two ride-hailing apps, and reaped $1 bln in maps and marketing spend. Uber and Lyft’s rivalry will keep filling Google’s tank with ad dollars, even as Alphabet’s self-driving tech threatens their existence. The ride-hailing app says its target market for mobility, meal delivery and freight is worth $4.5 trln, or 5 pct of global GDP. Yet that potential attracts fierce competition, which explains the company’s massive losses and stalling growth. Uber’s reach may exceed its grasp. Disney's flagship video-streaming product will cost users less than Netflix, boss Bob Iger says. That’s aggressive. Even if the Magic Kingdom has the brand and content to attract millions, competitors will swing hard. Meanwhile Iger may not stick around to see the results. The ride-hailing app’s mega-IPO could value it at nine times revenue. That’s less than the multiple Lyft achieved, but its stock has tanked. Both firms are burning cash and face an uncertain road to profitability. Uber’s diversification may help it survive the long journey. The Amazon founder’s bold bets helped the e-commerce giant create a $30 bln cloud unit. His annual letter talks about winning more commercial-database business. It’s a warning for Oracle’s top executives, who will need to better justify their pay if they’re to see Bezos off. Zoom may be worth more than $9 billion when it floats thanks to its astonishing growth – and, rare for a 2019 tech IPO, its profitability. Sky-high valuation multiples make the firm’s China-centered R&D effort financially appealing, but there’s significant political risk. The social-scrapbooking app wants a lower value for its stock-market debut than its last price tag of $12 bln. It may bode ill for tech IPOs after Lyft sputtered. But Pinterest’s finances are healthier than other startups going public. Being conservative can work in its favor. The activist behind Third Point is building a stake in Sony and getting the Japanese group to sell its movie studio could be part of the plan, Reuters reported. The media landscape has changed since Dan Loeb last tried to break Sony up. The idea looks ready for prime time. The government may fine groups like Facebook – and senior managers – who fail to police harmful content. This adds teeth to lame social-media regulation, but also creates a UK-specific standard. As other states beef up local regulations, web groups’ margins will feel the squeeze. The largest U.S. exporter, just like the Chinese telecom giant, is a national champion with hard-to-avoid products and a big image problem. Their respective governments have made things worse in different ways. Of the two, the airplane maker has a better route out of ignominy.